When most people think of “Jewish food” they likely think of bagels, blintzes – or perhaps matzo ball soup. For a funny take on it, check out this Buzzfeed video. What most people don’t know is that those types of Jewish foods actually are traditional only for Ashkenazi Jews – those from Northern Europe whose native tongue is Yiddish. Luckily for me, my mother’s family is from Southern Europe, which means they are Sephardic Jews, originally from Spain, who speak Ladino. The good news is that the food is WAY better! Sephardic Jews eat a Mediterranean diet – rich with fresh vegetables, flavorful herbs, fish, olive oil and bold flavors. 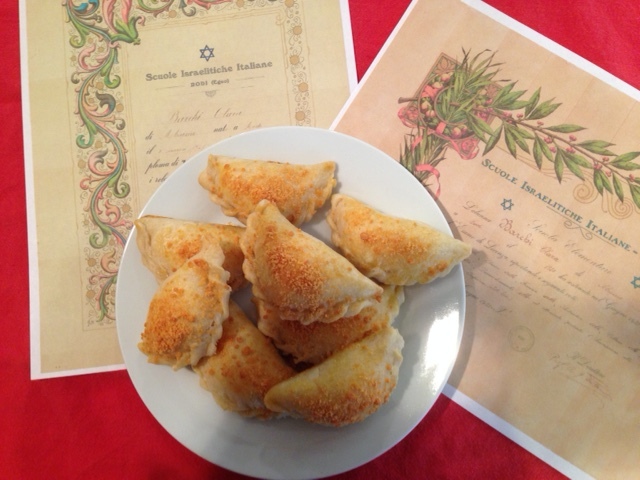 Sephardic Jews also make delicious and memorable savory pastries, ones that are so good they’re not easily forgotten and are often craved and practically inhaled by our children any time they are lucky enough to get them. In this part of the country, you can’t buy these pastries in the store. Each is handmade using recipes passed down from one generation to the next. I recall my grandmother and great aunt making these pastries. They fed them to us any time we visited and ALWAYS sent home a care package “for the ride.” Over the past year or so I have worked hard to perfect one of these pastries – borekas (pronounced Bor-EK-ahs). These are potato and cheese-filled turnovers. Anyone familiar with a Spanish empanada will see the resemblance. My youngest son loves them and will eat a dozen at a time. When his friends come over they’re gone within minutes. Why am I writing about borekas? I’m writing about them because I recently helped make 1,100 of them for the 100th anniversary of the Kline Galland nursing home in Seattle. My aunt told me a group of women were making them and I volunteered to step in, figuring they could use all the help they could get. She reluctantly agreed to let me help, after warning me that mine probably wouldn’t be good enough. I have since learned that making borekas is more than simply following a recipe. To the elderly Sephardic women around here, it is an art form. And if you can’t do it right, you may as well not do it at all. What could be so difficult about making a potato and cheese turnover? One word: “repulgo.” Repulgo is the Spanish and Ladino word for “hem,” or “fancy edge.” If it’s not done correctly then the borekas, it seems, should be trashed. I learned this the hard way during my volunteer cooking session. I sat down with about a half dozen other women with a pile of dough and a bowl of mashed potatoes in front of me. I can crank out about 60 borekas an hour at home. I’m fast. And based on the way the borekas are inhaled, I figure they’re pretty good. So, I started rolling out little circles of dough, filling them with balls of potato, and creating my “repulgo” edge. Whoa! Just as my aunt had predicted, I was quickly told mine weren’t good enough. My repulgo was too thick. It wasn’t pretty enough. Tsk, tsk, tsk. I was told that my borekas probably weren’t good enough to be served. I received a lesson in how to make thinner, prettier repulgo. I was left to struggle on my own and it was suggested that perhaps I focus on rolling and filling instead of actually finishing the borekas with the fancy edge. One of the other women – with more experience and more wrinkles – could do that part for me! I came home pretty dejected. All I wanted to do was to volunteer and to learn. I mentioned this to several Sephardic friends of my generation and they confirmed similar stories. We would need much, much more practice before our borekas were good enough. These friends also had been chastised by their senior relatives as they worked to perfect their own repulgo. Who knew? I thought I was just making pastries. Upon reflection, I’ve come to realize it’s more than that. It’s about tradition. There is a lot of cultural history behind these seemingly simple borekas. My mother and grandmother’s generation spent their days in “the old country” raising their children and keeping house. They took pride in their handiwork – whether it was the food they cooked or the needlework they created. When they were forced to leave during WWII they could bring very few possessions with them. But they had their traditions. And as traditions, it’s important to preserve them as they were. Slow, deliberate, painstakingly perfect little pastries as a reminder of home.